This room is dedicated to journalists, media, analysts or professionals in charge of news websites. Here you will find our press kit, our press releases, the ways to quickly contact us and the subscription to our mailing list (in order to receive our press releases). In one sentence: April is a major actor in promoting and defending free software. Download the press kit in pdf file..
Download the file for 10th anniversary of the organization on November 21, 2006. Download also the 2006 synthetic yearly report (pdf file). April logo in different formats. To be included in the press releases broadcast list, contact contactez nous. Several short interviews (less than two minutes each) with Benoît Sibaud, President of April from 2005 to 2010 (realized in 2005 by Fabrice Lourie from the Cité des sciences et de l'Industrie). Here are the last news of April. To follow the news of the association, subscribe to the mensual newsletter and/or to the RSS feed. Some free software partners or actors accepted to bear witness to April's importance. Since 1996, April members answer to a great number of interviews for the paper (Libération, Le Monde, Les Échos, Nouvel Obs, etc) and online media (ZDNet, Journal du Net, PC INpact, etc) as well as for radio (Radio France, RFI, BFM, etc) and TV stations (France 2, France 3, LCI, iTélé, Arte). To contact us quickly, here are the e-mail addresses and phone numbers of the main April stakeholders. You will find below some details on their respective areas of expertise. In case of doubt, please contact the General Delegate who will guide you to the right person. For any question in the business area, April's firm members can also be consulted. Don't hesitate to contact the General Delegate for further details. By clicking on the pictures, you will obtain a picture in a higher resolution. Expertise: Free Software and companies. Benoît Sibaud, Vice-President (Mini Resume). Email : bsibaud@april.org. Tel. : +33 681 181 130. Frédéric Couchet, Executive Director (Mini Resume). Jeanne Tadeusz, Public Affairs Officer. Expertise: institutional, legal and regulatory issues. Email: jmonnet@april.org. Tel : +33 624 872 919. 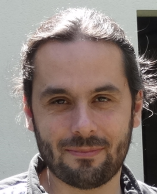 Loïc Dachary, Honorary Member and Volunteer Advisor (Resume). Email: ldachary@april.org. Tel: +33 176 607 281. Expertise: GNU Project, Free Software licenses, software development.